BENCH BOOST: So we at FFT think its a good idea to try out the new BENCH BOOST option this week, which allows all your bench player’s points to be added to your total score for the week. Its a fun option added in by FPL this season, and seeing how we’re fielding a well balanced team for GW10, we thought of giving it a shot. Let us know in the comments section if you’re planning on trying it out too. Arsenal have now kept three clean sheets in their last 3 games, with two of them coming against heavyweights like Manchester United and Bayern Munich. So its no surprise then that Cech (5.6m) is our man between the sticks for this week. With a run of easy fixtures coming up for them in a few weeks, we suggest hanging on to the former Chelsea man for a while. Alternatives: West Brom’s Myhill (4.6m) is our alternative pick this week, after a strong display at the back earned him 2 bonus points. This week they face off against Norwich, and should have no trouble shutting out the out of form Canaries. Our first pick in defense is the in form youngster Bellerin (5.8m). With 2 assists, 2 clean sheets and 2 bonus points in his last 3 games (not to mention his stunning late run and assist against Bayern in the midweek fixture) the 20 year old has been in red hot form for the Gunners and is sure to pick up good points against Everton. Dawson (5.1m) and Alderweireld (5.2m) face off against easy opposition this week in Norwich and Bournemouth respectively, and will be looking to make it 2 in 2 clean sheets after last week’s solid displays at the back. Alternatives: Arsenal’s budget friendly new signing Gabriel (4.9m) and Swansea’s Taylor (5.0m) are our alternatives picks for this week as they face off against easy opposition. 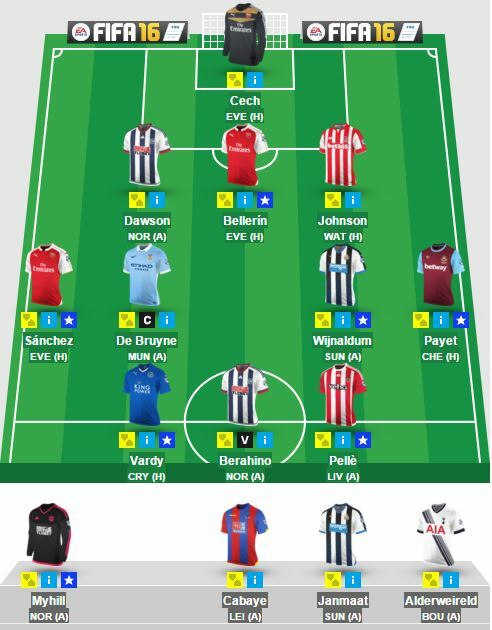 All of our midfield choices for GW10 pick themselves after superb performances in the previous gameweek. Starting off with the most obvious pick first, Wijnaldum (6.9m) hit 4 goals and picked up maximum bonus points to get a whopping 25 points for his owners last week. With a trip to a leaky Sunderland side that has conceded 6 in their last 3 games, we expect him to light up the PL this week too. Next up are two of London’s finest, Sanchez (11.m) and Payet (8.2m), who have been in top form picking up 8 goals and 1 assist between the two of them in their last 3 games. Both are an absolute must for your FPL teams if you wish to be on par with, if not stay ahead of the competition. De Bruyne (10.5m) retains his spot on the team after another consistent performance, that saw him pick up an assist last week, taking his tally to 3 goals and 3 assists in his last 3 games for the reigning champions. Lastly Cabaye (6.6m) is our final pick, having picked up 3 goals, 1 assist and 7 bonus points in his last 3 games for the Eagles. A real budget friendly option to consider bringing in for this week. Alternatives: Manchester City’s Sterling (8.8m) offers a more economical route into City’s attack, and is our first alternative pick. Another economical option to consider is Arsenal’s Ozil (8.5) who has picked up double figures in his last 2 games for the Gunners. England’s hottest striker Vardy (7.0) has set the league on fire since GW1 and looks unstoppable with 9 goals and 1 assist in the first nine weeks itself. Priced at a measly 7.0m, it’s no surprise that hes already owned by 40.4% of FPL managers. If you’re not one of them, its never too late to jump on the bandwagon. Pelle (8.3) retains his spot in spite of drawing a blank last week, as the Saints take on Liverpool on the road. The Italian was in good form before the international break (1 goal and 4 assists in his last 3 games) and we’re confident he’l get on the scoresheet this week. Our last pick is someone who has slipped under the radar in light of other magnificent displays off late. We’re talking about West Brom’s Berahino (6.2m) who has scored 3 in his last 4 games and takes on a Norwich side this week who have shipped 10 goals in their last 3 games alone. This entry was posted in General, Squad and tagged english premier league, EPL, Fantasy Football, fantasy football squad, fantasy football tips, fantasy football transfers, fantasy premier league, football transfers, FPL, Gameweek 10, GW10, Transfer Tips. Bookmark the permalink.